New in Paperback "A postmodern literary masterpiece." -The Times Literary Supplement Two hundred years after civilization ended in an event known as the Blast, Benedikt isn't one to complain. He's got a job--transcribing old books and presenting them as the words of the great new leader, Fyodor Kuzmich, Glorybe--and though he doesn't enjoy the privileged status of a Murza, at least he's not a serf or a half-human four-legged Degenerator harnessed to a troika. He has a house, too, with enough mice to cook up a tasty meal, and he's happily free of mutations: no extra fingers, no gills, no cockscombs sprouting from his eyelids. And he's managed--at least so far--to steer clear of the ever-vigilant Saniturions, who track down anyone who manifests the slightest sign of Freethinking, and the legendary screeching Slynx that waits in the wilderness beyond. Tatyana Tolstaya's The Slynx reimagines dystopian fantasy as a wild, horripilating amusement park ride. Poised between Nabokov's Pale Fire and Burgess's A Clockwork Orange, The Slynx is a brilliantly inventive and shimmeringly ambiguous work of art: an account of a degraded world that is full of echoes of the sublime literature of Russia's past; a grinning portrait of human inhumanity; a tribute to art in both its sovereignty and its helplessness; a vision of the past as the future in which the future is now. where snow falls constantly and mice are the staple of people's diets. scribes is Benedikt, a simple man who has never actually read a book. by the Oldeners, those who recall the world before the fateful blast. gifted Tolstaya." --Kirkus Reviews The Slynx, with its comical, tragical, post-nuclear holocaust setting, is a satirical blast, a linguistically inventive glimpse of a future nobody wants to see. -- Alan Cheuse, All Things Considered It is impossible to communicate adequately the richness, the exuberance, and the horrid inventiveness of The Slynx. -- John Banville, The New Republic [a] spellbinding futuristic novel....Tolstaya's radioactive world is a cunning blend of Russia's feudal and Soviet eras, with abuse of serfs, mandatory government service, and regulation of literature. The dangers that threaten, however, feel more contemporary: to the south, Chechens; and to the west a civilization that might hold some promise, except that its members "don't know anything about us." The Slynx is a profound work. It is well served by Jamey Gambrell's fine translation. 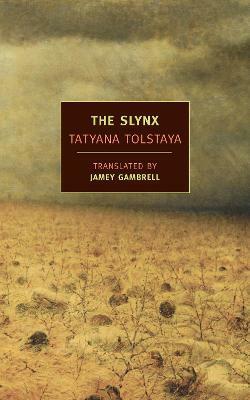 Born in Leningrad, Tatyana Tolstaya comes from an old Russian family that includes the writers Leo and Alexei Tolstoy. She studied at Leningrad State University and then moved to Moscow, where she continues to live. She is also the author of Pushkin's Children: Writings on Russia and Russians. Jamey Gambrell is a writer on Russian art and culture. Her translations include Marina Tsvetaeva's Earthly Signs: Moscow Diaries 1917--1922 and Vladimir Sorokin's Ice, published by NYRB Classics on December 2006.